Hart island has certainly seen its fair share of functions, with the earliest being that of a private residence for the owner Thomas Pell who bought the land off the Native Americans in 1654. The island went through various ownerships until it was sold to the city of New York in 1868. After this date things really got interesting, with the island being used for a number of functions, but the main one of which was a prison and a potters field, which is a cemetery for people who's identity is unknown. The first inmates of the prison were actually captured confederate troops during the American civil war. Almost 3,500 troops were imprisoned here during the 4 months it was used as a prison camp in the year 1865, with 235 of them dying in the camp during this time. Hart island is also home to the largest tax funded cemetery in the world, spread across 101 acres and contains well over 1 million corpses. 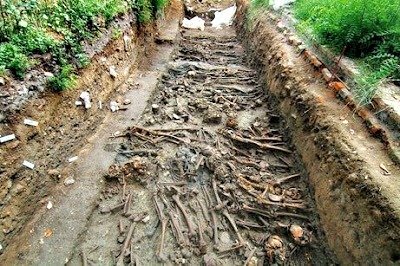 The first bodies were placed here during the American civil war but since then bodies have been placed here regularly, often placed in mass graves, with adults being buried in groups of 48 and infants being placed in mass graves of up to 1000. Since Hart island has been used on and off as a prison for some time now, its not hard to imagine that they would have put some of the inmates to good use during the earlier years, which is exactly what they did with the introduction of a boys workhouse. This was a notoriously cruel place to be forced to work but had a golden reputation compared to the woman's lunatic asylum that operated here. Fortunately this didn't last for long and was soon relocated to free up island space for more burial room. After the asylum had moved some of the buildings were converted into a sanatorium to help treat the outbreak of various diseases of the day, mainly tuberculosis. 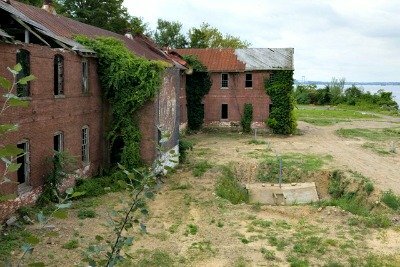 Apart from these functions the only other notable use of the island was when it was used as part of the United states army base fort Slocum between 1956 and 1961. Between this time it housed Nike Ajax missile silos but they were eventually relocated and the last parts of the missile base was closed in 1974. The island is currently controlled by the city of New York's department of corrections and is currently uninhabited. Only people who are granted permission from the department of corrections may enter the island and it is strictly off limits to the press. Since Hart island has had everything from confederate troops to an asylum to hundreds of thousands of unidentified bodies it would be hard to believe that it isn't haunted. Many of the buildings from the earlier days are now gone however, such as all of the buildings from the civil war days along with the asylum and almost all of the earlier prison buildings and most of Fort scolums buildings have also been torn down to make more burial room. But just because the buildings are gone doesn't mean the inhabitants have disappeared. As for actual paranormal activity the list of what doesn't go on here would be a lot easier to list than the experiences people have had in this creepy place. One of the most interesting stories I have heard more than once of this place is not the experiences people have had while being there, but more of the ones they have after they leave. A number of people have claimed to have had very vivid dreams of the island in the days after they have visited it, which more often than not include seeing the island in their dreams as it was when the original prison stood, along with what has been described as the old asylum building. This seems rather strange as most of the paranormal experiences people have on the island seem to happen around these 2 areas, with everything taking place from sudden and intense feelings of nausea and cold spots, to people claiming to be physically pushed with enough force to put them on the ground. The feeling of being watched and someone standing close by can be felt across the whole island, no matter how far from the next person you are or even if you know for sure you are the only (living) person in any of the buildings. Apparitions can also be seen here in large quantities, mostly during mist covered mornings when silhouettes can be seen moving through the fog, only to disappear into the fog if approached. If you have had an experience or even just visited this island I would love to hear from you on how you found it, though I suspect very few people visit this place since it is so carefully controlled by the cities department of corrections.